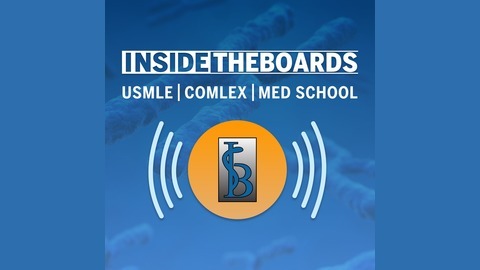 The best free audio resource for board prep: USMLE, COMLEX, Med School and beyond. Today's episode is with Andre Paul, founder of Board Vitals. We break down a practice question related to pulmonary disease and discuss what Board Vitals does to help learners throughout all stages of medical education. ITB listeners can get a 15% discount on Board Vitals products by using the code ITB2019 when they sign up. Just go to boardvitals.com. At the end of the episode, Patrick gets a little philosophical and personal plus dedicates a poem he wrote during a GYN Onc rotation to his late Grandpa Fresch. Check out the ITB Study Smarter Series Podcast channel. We're covering some high yield IM content until early April, then we launch into our annual USMLE Step 1 Study Smarter Series. Go to bit.ly/ITBpodcasts or just click here to check it out on iTunes. We're launching a new podcast. It's focused on high-yield, physiology for first and second year medical students, especially those studying for their USMLE Step 1 or COMLEX Level 1 Exam. It's called Physiology by Physeo (An InsideTheBoards Podcast) hosted by our own Greg Rodden. Subscribe on Apple Podcasts so you know when the new episodes drop. For now, listen to the trailer to find out how you can get a 25% discount on a premium Physeo subscription. You can also listen to Physiology by Physeo on Podbean and Spotify. Subscribe to it now! The ITB iOS app is (finally!) here. 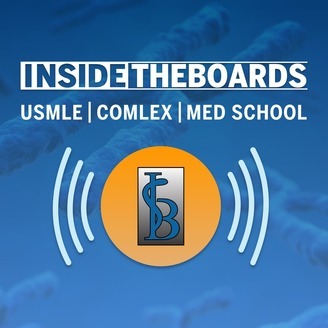 It includes all our podcasts (with exclusive and expanded content), early access to podcasts we'll be releasing in the future, some meditations designed specifically for medical students and especially intended for use during your dedicated USMLE prep time (gotta keep those stress levels down, right? ), plus the beta version of our all audio qbank. Step 1 is powered by Exam Circle and Lecturio, and the Step 2 version is powered by OnlineMedEd. There's a sample of high yield audio questions for each version, and of course you can purchase a subscription to help us finish the full scale, Android and iOS app, which will have tons more features. It's not perfect. But it is THE PERFECT companion for studying for the boards on the go. And we're adding content and improving it all the time. Search the App Store for "InsideTheBoards" or click here to download it now. Android user? Until we release the cross-platform version of the app this summer, you can still subscribe to the podcast version of ITB's All-Audio Qbank by clicking here. We're giving away all kinds of prizes in exchange for your help promoting InsideTheBoards. You earn entries by completing certain actions like sharing or reviewing our podcasts. But you probably know that ITB is all about promoting the wellbeing of medical students. So we also want to push the hashtag #listenlearnlive. The "live" part of this represents our interest in not just your scores, but also your lives outside of medicine. Hence, you can also earn entries just for doing healthy things like exercising, walking your dog, spending time with your fam, or listening to music and then snapping a photo, tagging us, and using the hashtag #listenlearnlive in a social media post. It's actually three separate, month-long contests running now through July. The Top Three winners at the end of each month's contest will be placed into a drawing for the Grand Prize: your USMLE Step 1/Step 2 or COMLEX Level 1/Level 2 Registration Fee (thanks to the generosity of Physicianloans.com )That's a prize worth over $600. We're also giving away things like subscriptions to our All-Audio Qbank. Just go to bit.ly/paymyusmle to sign up.